fewer infections and other illnesses. Children who eat well usually grow well.Women who eat well are likely to produce healthy babies. That is why it is important to know which combinations of foods make good meals and what the different food needs of different members of the family are. 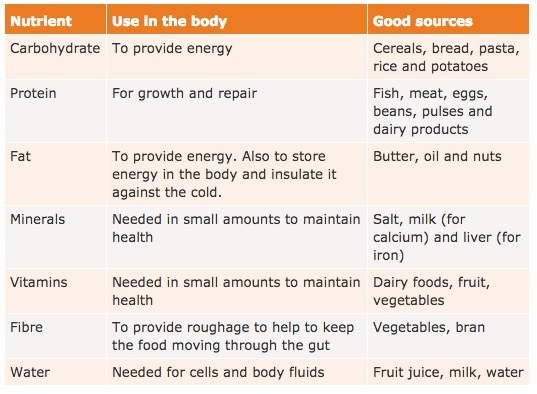 In this unit you will learn about how and why we need nutrients and how our bodies are supplied with energy. Just as a power station requires gas or coal to power its turbines and generate energy, so we need fuel – in the form of food – to power our continued existence. The foods we eat provide us with a range of nutrients: vitamins, minerals, water, fat, carbohydrates, fibre, and protein. These nutrients are put to different uses — as building materials to construct the tissues and organs from which our bodies are made; as the components of the molecular machinery that keeps our cells running as they should. All of these uses are unified by a common theme: a requirement for energy to make them happen. All living things contain organic macromolecules: Lipids, proteins, carbohydrates and nucleic acids. Characteristic for these organic molecules is that they are made up of only a small number of elements: carbon, hydrogen, oxygen, and to smaller amounts nitrogen, phosphorus and sulfur. They are called "macromolecules" because they are very large, containing long chains of carbon and hydrogen atoms and often consists of repeating smaller molecules bonded together in a repeating pattern (polymers). 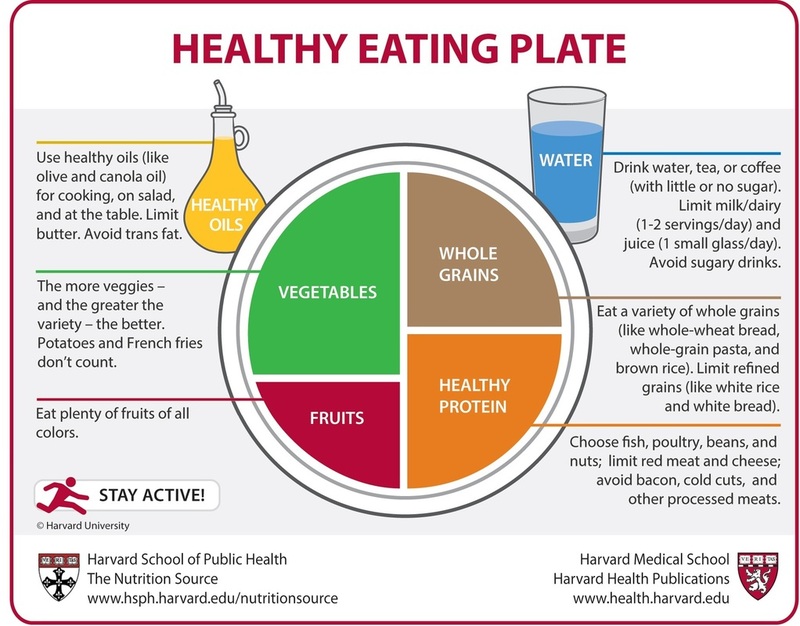 Despite what you see in some diet books and TV programs, healthy eating can be really straightforward. A diet based on starchy foods such as potatoes, bread, rice and pasta; with plenty of fruit and vegetables; some protein-rich foods such as meat, fish and lentils; some milk and dairy foods; and not too much fat, salt or sugar, will give you all the nutrients you need. Starchy foods should make up around one third of everything we eat. This means we should base our meals on these foods. Potatoes are an excellent choice and a great source of fibre. Leave the skins on where possible to keep in more of the fibre and vitamins. Meat, fish, eggs and beans: all good sources of protein. These foods are all good sources of protein, which is essential for the body to grow and repair itself. They are also good sources of a range of vitamins and minerals, including iron, zinc and B vitamins. It is also one of the main sources of vitamin B12. Try to eat lean cuts of meat and skinless poultry whenever possible to cut down on fat. Milk and dairy foods such as cheese and yoghurt are good sources of protein. They also contain calcium, which helps keep your bones healthy. To enjoy the health benefits of dairy without eating too much fat, use semi-skimmed, 1% fat or skimmed milk, as well as lower-fat hard cheeses or cottage cheese, and lower-fat yoghurt. So how do you figure all this out? Thank goodness for food labels! 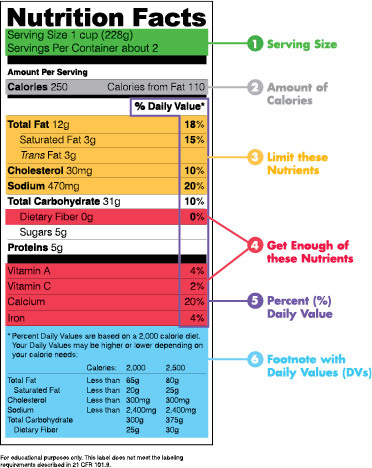 Labels give you information that can help you decide what to choose as part of an overall healthy eating plan. For example, it may be OK to eat a sugary cereal if you make up for it by not eating much sugary stuff for the rest of the day. Checking the labels on foods can alert you when a food is high in something like sugar so you can be prepared to make tradeoffs. Nutritional imbalance can be caused by an inability of the body to absorb certain nutrients or result from a poor diet. Depending on the nutrients in short or excess supply, imbalances create unpleasant side effects and conditions that could lead to serious disease. When you are overeating, you chronically take in more food energy, or calories, than you need, leading to weight gain, overweight and obesity. Overeating puts you at risk for heart disease, cancer, diabetes and complications related to overweight and obesity, according to the World Health Organization. Your body needs the right amount of energy to function properly, so overeating is likely to leave you feeling tired and irritable, too. 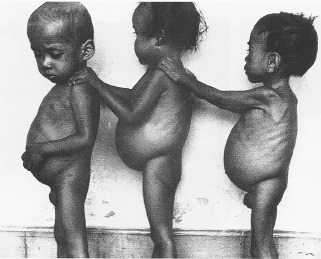 When a person is not getting enough food or not getting the right sort of food, malnutrition is just around the corner. Even if people get enough to eat, they will become malnourished if the food they eat does not provide the proper amounts of micronutrients - vitamins and minerals - to meet daily nutritional requirements. Salt is an essential part of our health. Adults need less than 1 gram per day and children need en less. On an average we are eating approximately 8.1 g of salt per day, far more than the recommended maximum of 6 g per day, putting us at risk of all of the health problems. Too much salt increases our blood pressure. Raised blood pressure (hypertension) is the major factor which causes strokes, heart failure and heart attacks, the leading causes of death and disability throughout the world. There is also increasing evidence of a link between high salt intake and stomach cancer, osteoporosis, obesity, kidney stones, kidney disease and vascular dementia and water retention. Your digestive system is uniquely constructed to perform its specialized function of turning food into the energy you need to function and packaging the residue for waste disposal. 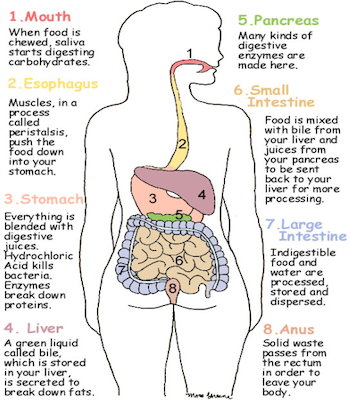 Enzymes are important in digestion. 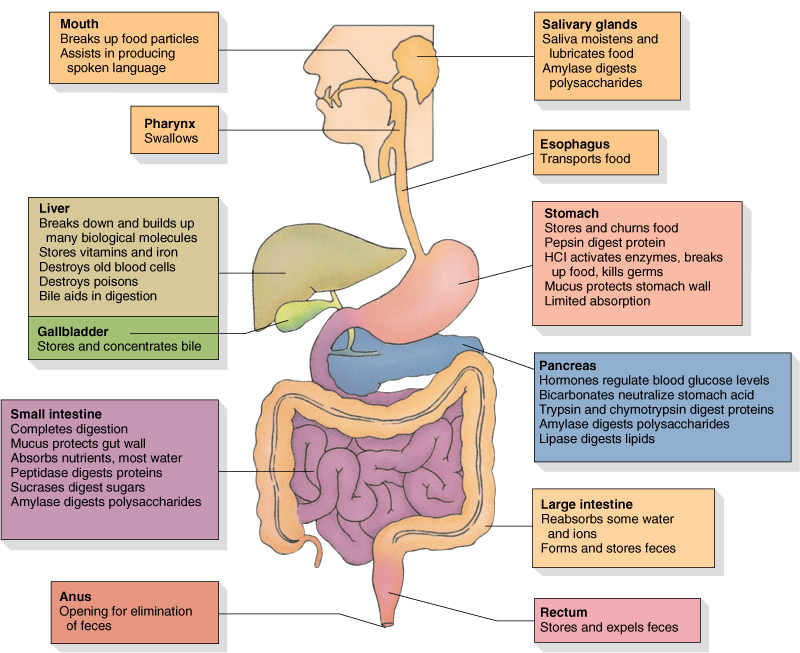 Digestion is the breakdown of large molecules, carbohydrates, proteins and fats, into smaller, soluble molecules that can be absorbed into the blood. Enzymes are considered to be catalyse for different digestion reactions. Catalysits help speed up the reaction of breaking down the foods. 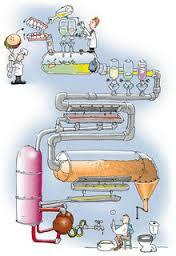 Digestion: process in which large insoluble molecules of food are broken down into smaller ones. 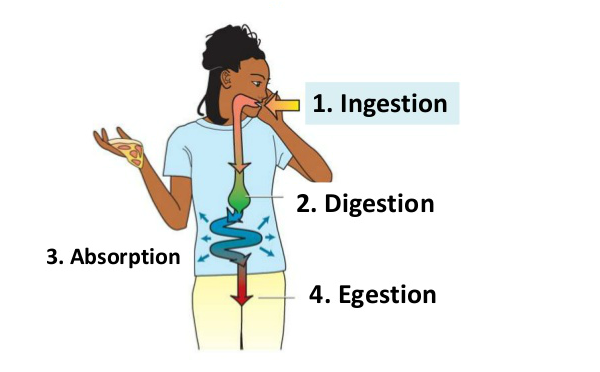 Absorption: the process by which soluble molecules produced by digestion are taken from the gut (occurs mostly in the small intestine.) The soluble products of digestion are then transported to the various tissues by the circulatory system. Assimilation: the cells of the tissues absorb the molecules for use. Egestion: removal of waste- undigested- products as faeces. Excretion: removal of waste products that have been in the body. Look at the bitesize pages for nutrients, diet, the digestive system and enzymes. Label the digestive system on the CGP books website. Companies spend billions of dollars promoting sweet cereals, soda, and fast food to the most impressionable viewers. Help steer your kids away from all the unhealthy marketing. Several legal suits have been brought against McDonald's Restaurants that they are knowingly selling food that is unhealthy. Some of the court decisions have stated that the plaintiffs would have a claim if they could prove that eating the food every day for every meal is dangerous. As such, documentarian conducts an unscientific experiment using himself as the guinea pig: eat only McDonald's for thirty days, three meals a day. Join Jamie Oliver in curing the obesity epidemic. We join hands with him. 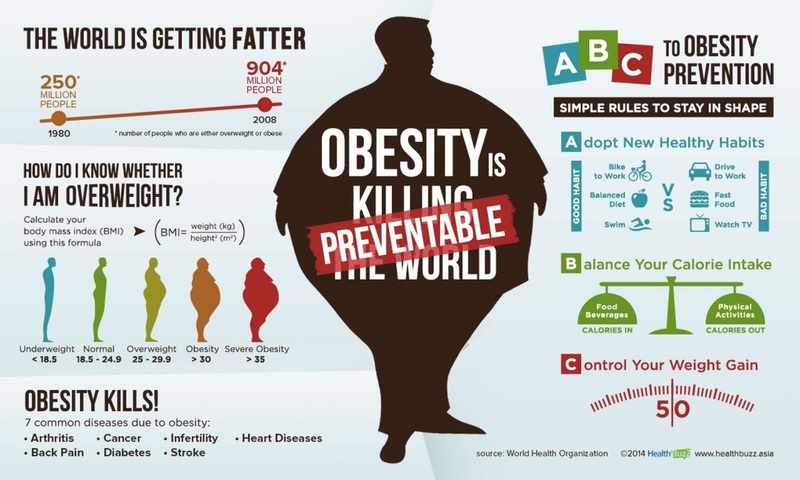 Obesity is the biggest killer today....and it is preventable. How to cure obesity. Teach kids how to cook. Teach kids about food. Nutrition should be taught in schools. Teach kids by showing them what is in food. Kids must learn what vegetables look like in its natural state. Living healthy is easy.